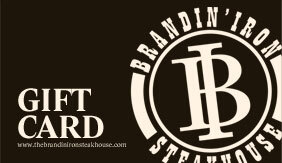 About Brandin' Iron Steakhouse... Coming Soon. The Brandin' Iron General Store can provide you with some of the basic items you may need like milk, eggs, ice, toiletries, and more. We also have a variety of goodies like fountain drinks, popsicles, ice cream sandwiches, candy bars, and both old fashioned and new candies.